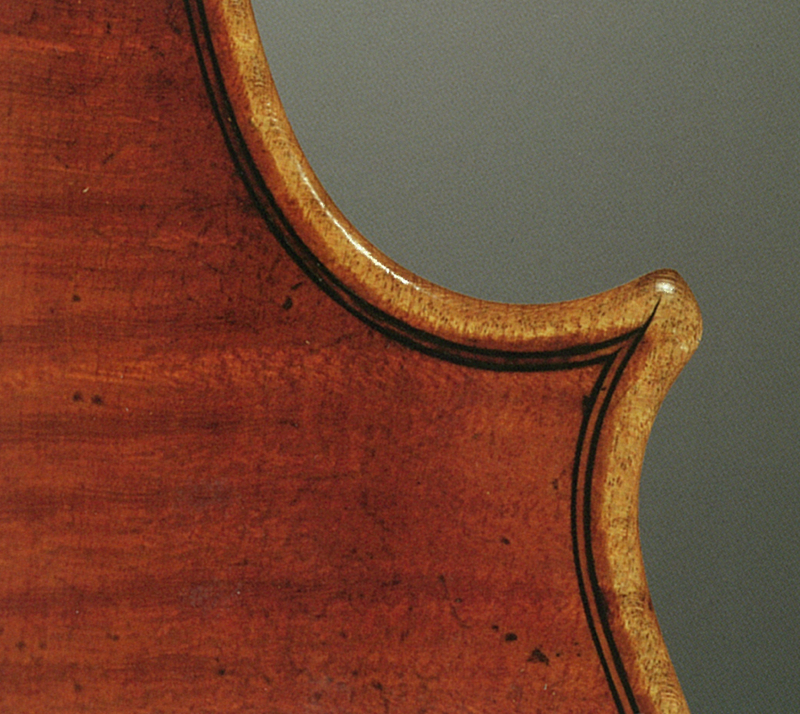 François-Louis Pique is not the most renowned luthier of his time – his colleagues Nicolas Lupot, Charles François Gand and Jean Baptiste Vuillaume all achieved greater fame. Yet when one looks closer at his life, he exerts an immediate appeal. Is it because he lived at the forefront of the exceptionally dramatic events of the French Revolution and then the Empire? Or because he witnessed at first-hand the spectacular changes in French society and attitudes? 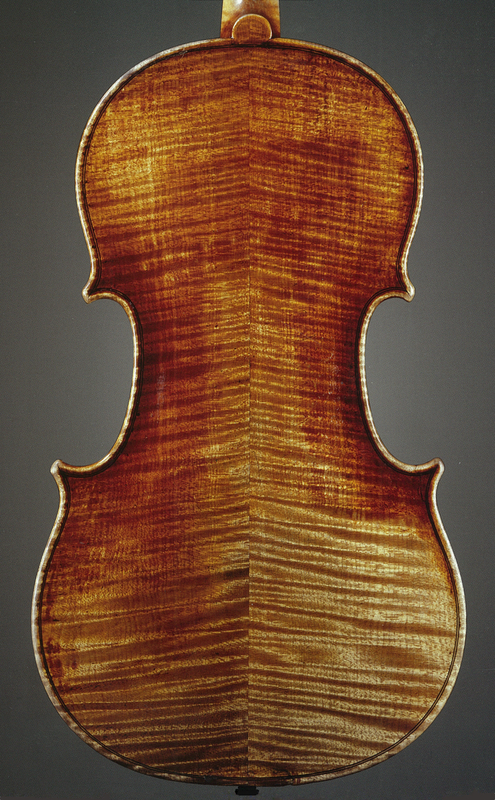 Or perhaps because violin making was transformed during his time, abandoning the models of Amati and Stainer in order to adopt those of Stradivari, then Guarneri? For all of these reasons, and more! Let us take a closer look at his life and work. Pique was born on October 5, 1758 in Roissy, in modest circumstances: his father was gamekeeper for the local châtelain and one of his brothers was employed there as a servant. 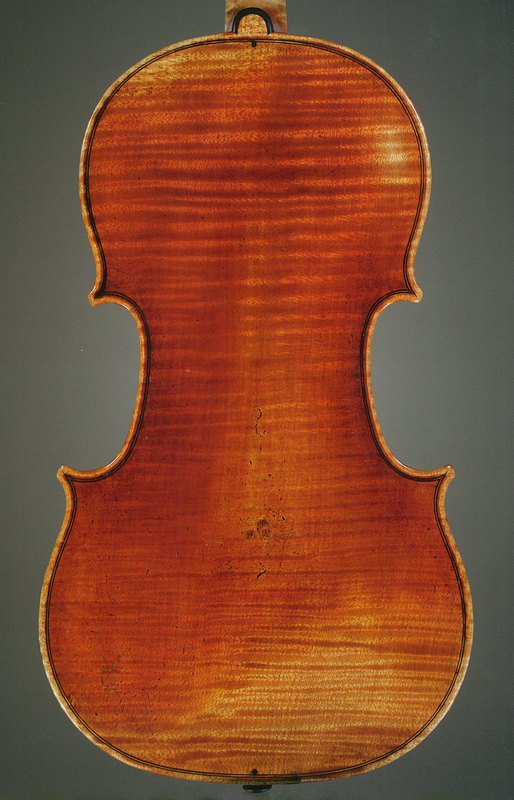 There follows a long silence before in 1788 we find Pique established as a dealer–luthier in the center of Paris, at rue Plâtrière (today rue Jean-Jacques Rousseau) near the Saint Eustache church, then in the same neighborhood at 8 rue Coquillière. The area must have been bustling with activity: Pique’s building was located opposite l’hôtel du Roulage de France – a haulage company that was the starting point for carriages headed towards the provinces and even towards some foreign countries. At this point Pique was around 30. Why did he chose this profession? Who taught him? We do not know. But Roissy is not far from Paris, where one of his uncles lived. Pique’s shop was not on the ground floor, but under the porch of his house. Inside were two rooms, a cave and an attic containing the usual inventory found in a luthier’s workshop: wood stock, cases and old instruments. On May 6, 1791 Pique married Agnès Payen, the daughter of a neighboring butcher. The marriage contract reveals that his business was successful: the shop and the workshop were valued at 10,000 livres, plus 20,000 livres in cash. Although he was still in a quite modest setting, the political situation had dramatically changed. Events had turned violent after 1789 and the nobles and clergy had fled the country. The government had confiscated their property and was now reselling it as national property for low prices. It was a good way for the new République to rebuild its funds, but also to allow less fortunate citizens to purchase land, houses and works of art that were previously out of their reach. This was perfectly understood by Pique’s father-in-law, Jacques Louis Payen, who seems to have been overtaken by a shopping frenzy, applying the new law to his advantage and acquiring three buildings successively, thus raising the family fortune to 239,897 livres! He thereby gained access to a higher rank in society, becoming a member of the haute bourgeoisie. 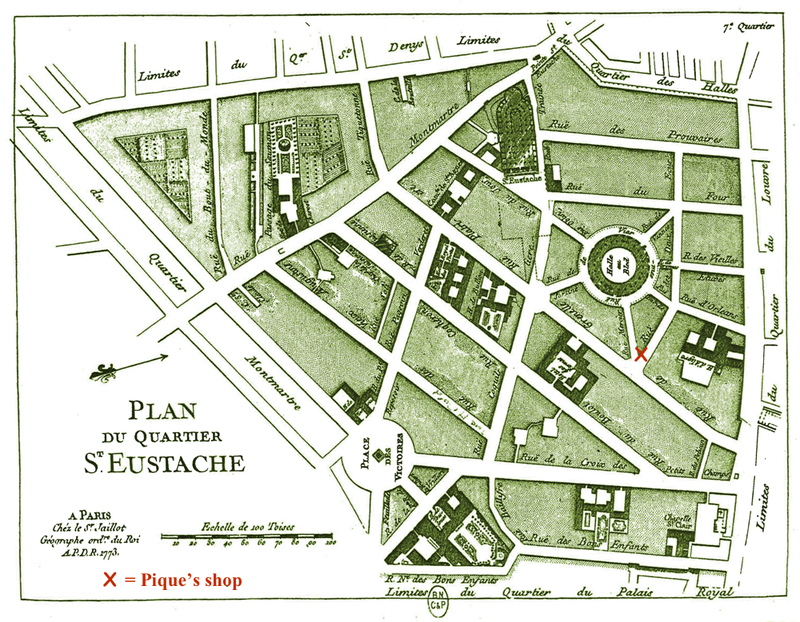 Pique seems to have decided to follow the same path, moving from the rue Coquillière to the nearby rue de Grenelle Saint Honoré, at the corner of the rue Deux Ecus, which became his permanent address. Two years later he purchased his last property, a country house in Saint Germain en Laye, near Paris. Such were the results obtained by the intelligence of citizen Pique, who by now was well off. Let us now turn to Pique’s profession. During this period he was very active, repairing old models but also interested in the instruments arriving from Italy. 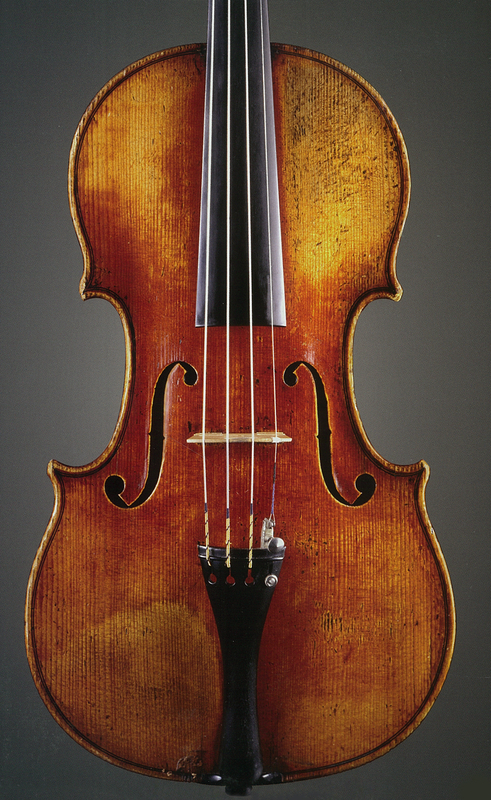 Chief among these was the 1709 Stradivari whose powerful and warm sound was seducing music lovers in the hands of Jean Baptiste Viotti. Viotti had made his Parisian debut in the Concert Spiritual on March 17, 1782 and remained in Paris for ten years, teaching his remarkable disciples Jacques Pierre Joseph Rode, Rodolphe Kreutzer and Pierre Marie Baillot. 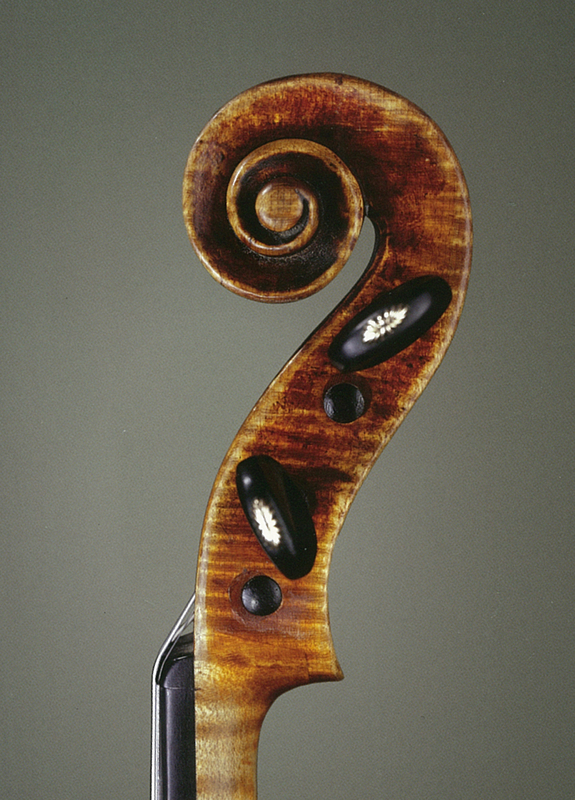 Under his direction they discovered the quality of Italian violin making, and French lutherie therefore began to lose its appeal for both amateurs and professionals. Facing these transformations, Pique appears to have felt the need to find a collaborator to help him. He chose a young colleague in Orléans, Nicolas Lupot. 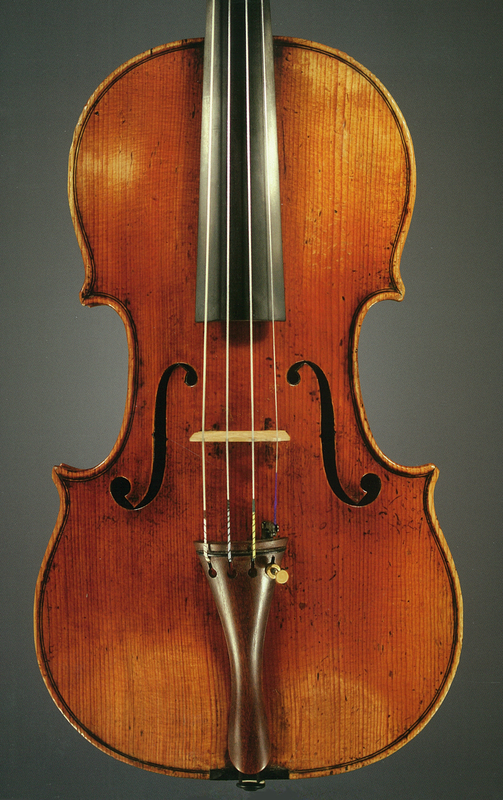 At that time Lupot was completely unknown in Paris but his skills had been recommended to Pique by the Orléans violinist Michel de Woldemar, who gave Lupot his instruments to maintain from time to time. Pique proceeded cautiously. He began by ordering some varnish from Lupot. Then he offered to commission a few instruments from him, giving him wood and some aesthetic guidelines. Lastly, he suggested Lupot should move to Paris to work with him, which finally happened in 1796 due to the political troubles. This was when Pique chose his strongest model, probably thanks to collaboration with Lupot. The two instruments pictured here are examples of Pique’s style from the period 1788–1800. The outline is rather large, with full arching. In the back, two small maple pins are set on each side of the center joint, inside the purfling; the f-holes are long and the buttons are narrow. 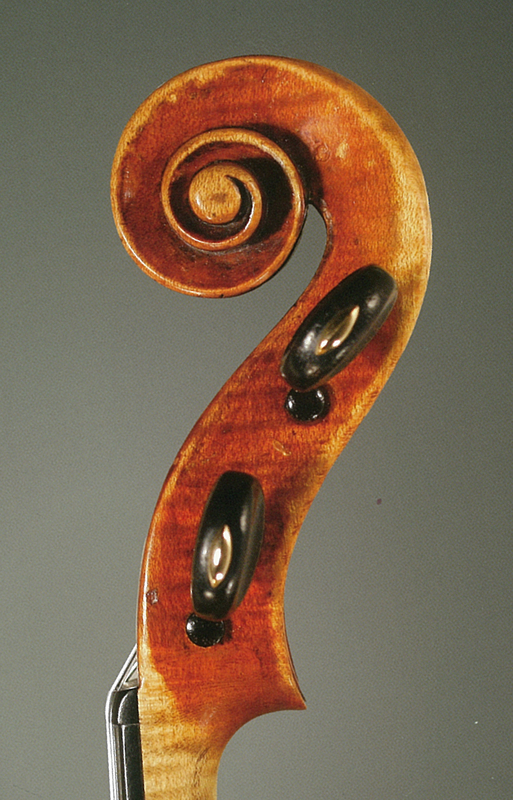 The wood is often wormy in this period, hence some small holes that the maker has attempted to hide under the varnish. The varnish is of a red or yellow-brown color, on a golden ground. Sylvette Milliot is an expert in French lutherie. This article is adapted from material published in her recent book ‘Nicolas Lupot, Ses Contemporains et Ses Successeurs’. In part 2 she continues the story of Pique’s career after 1800. Text translated by Marie Turini-Viard.